Personal mobile devices, including phones. 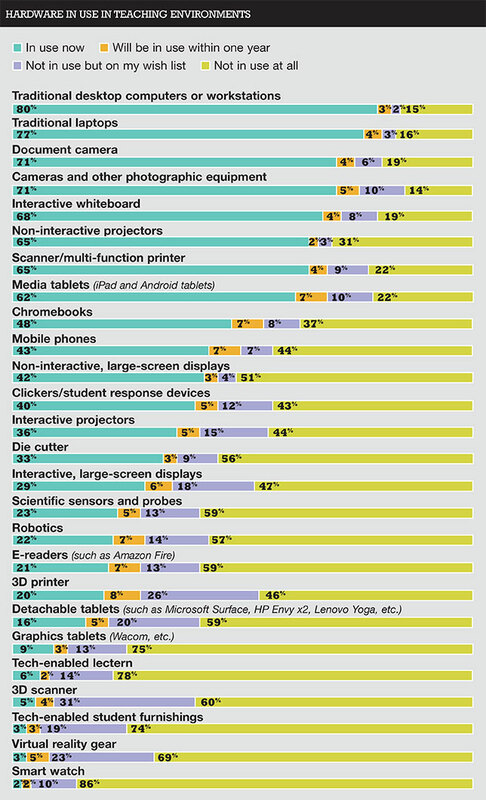 In a national survey of more than 1,300 K-12 educators, laptops, Chromebooks and media tablets were chosen as the most valuable tools for teaching and learning, while mobile phones and smart watches were cited as the least useful. The results were part of the first-ever Teaching with Technology survey, conducted by THE Journal. The aim of the survey was to gauge educators' attitudes toward the use of technology in the classroom, discover their current practices and learn what they'd like to see changed int he future. 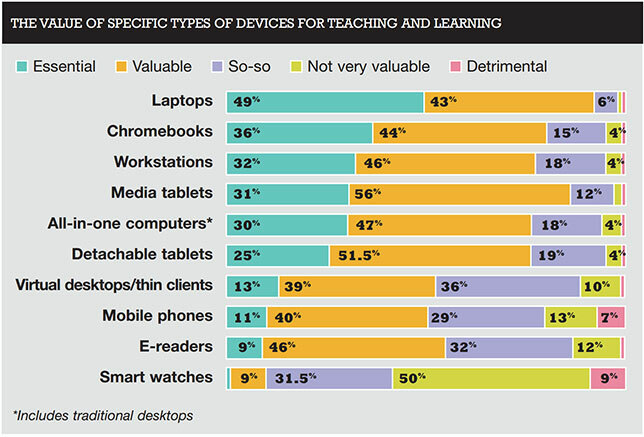 Among those surveyed, an overwhelming 92 percent said they see laptops as either "essential" (49 percent) or "valuable" (43 percent) for teaching and learning. Chromebooks, as a separate category, also seem to be cherished by educators, with 80 percent saying they are essential (36 percent) or valuable (44 percent). 3D devices, including scanners and printers. Virtual and augmented reality gear. Detachable tablets, such as the Microsoft Surface or Lenovo Yoga. 3D devices were also cited as the top technology category that would become important for education in the coming years, followed by augmented and virtual reality. Media tablets, which are currently experiencing a decline across all sectors, are nevertheless still viewed as important to the teaching and learning process, with 87 percent saying they are either essential (31 percent) or valuable (56 percent). The least valuable category of device among educators was, by far, smart watches, with 59 percent saying they are either "not very valuable" (50 percent) or actually "detrimental" to education (9 percent). Mobile phones came in a distant second, at 20 percent, with 13 percent saying they are not very valuable and 7 percent saying they are detrimental. However, among those tools that are currently in use by educators, mobile phones and personal devices are clearly the most reviled. That category topped the list in an open-ended question that asked educators, "Which technologies currently used in education do you wish you didn't have to deal with?" Interactive whiteboards were the third most-hated category. Sixty-eight percent of respondents said those are in use at their schools. Overall, our respondents are putting tech to use a lot in the classroom. Teachers reported using tech for instructional purposes on average about 61 percent of the time. One in 10 people use it all the time. The use of tech isn't a luxury for educators. For example, one special education teacher in a middle school in Scituate, MA considers the use of technology in school "critical" for her students. "It gives them increased access to the curriculum and provides multiple means of engagement and response," she explained. The five most common forms that instructional tech hardware takes right now are the traditional desktop computer or workstation, traditional laptops, document cameras, other kinds of cameras and interactive whiteboards. However, those certainly aren't on teachers' "wishlists. "That compilation is led by 3D technology, primarily 3D scanners and 3D printers, mentioned by 31 percent and 26 percent of respondents in that order. Virtual reality gear comes in third, and detachable tablets, such as the Microsoft Surface or Lenovo Yoga, is fourth. The full Teaching with Technology results and methodology can be found in the September issue of THE Journal in print and in our digital edition archives. Highlights and further results from the survey will also be posted on this site throughout the year. You can check back for ongoing reports in our Research section.